Election Day is just days away. Across the country, volunteers are walking door-to-door reminding people to vote. It’s all hands on deck, and we need every volunteer we can get, including folks who have never done it before. If you told me a year ago that I would be knocking on doors to talk to strangers about a candidate or to convince them to vote, I would not have laughed in your face. While I would have found the notion ridiculous, I would have just shrugged and smiled politely. That’s because I’m an introvert. I take my personal space very seriously, I’m usually exhausted (not energized) when engaging with others outside my normal sphere, and I try very hard to avoid confrontation. Oddly enough, I’ve found that all of those traits make me a fairly ideal door-to door political canvasser. How can that be? It’s because I sincerely empathize with the people on the other side of the door whodon’t wantordon’t liketalking to strangers who are essentially intruding on their property and time. If he hears, he’ll knock all day. I’ll be trapped and here I’ll have to stay. It’s a sentiment I understand completely, and since I consider myself a fairly considerate person, imagine the cognitive dissonance I had to deal with when I was asked to knock on other people’s doors! The first hurdle to overcome was getting motivated to walk neighborhoods and knock on doors in the first place. As introverts, if we’re going to step out of our comfort zones, there had better be a good reason to do so. For me, it was my wife (Carol Kim) and the campaign she ran for San Diego City Council in 2014. Some people might think introverts are self-absorbed and uncaring about others, but that’s not a fair characterization. Introverts can be just as idealistic and driven as anyone else, or even more so. It’s just that our determination manifests itself in different ways, in outlets such as writing or other creative endeavors that don’t involve face-to-face interaction. But since my wife needed me to walk and talk to folks as her spouse (and therefore the best representative of her values and character), of course I couldn’t say no. Despite my introvert’s preference not to do it, the idealist part of my personality won the day. I came to understand the importance of the work; personal testimonials are far more effective than campaign advertising. Another part of my personality took it as a challenge to see if I could do it (or even get really good at it). Whether it’s because we believe in the cause or we want to challenge ourselves, some of us introverts can be convinced to join the team. 1. Have a script ready and prepare yourself mentally. For some people, talking off the cuff comes naturally, but I find it useful to have my message prepared, with a couple different versions depending on what people know about the candidate or what they want to talk about. I’m not saying you need to memorize anything word-for-word, but if that makes you feel better, feel free to do that. 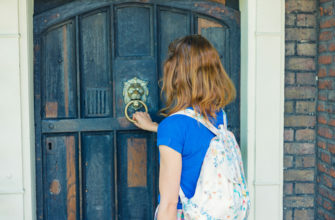 Knocking on doors is stressful enough; reduce your stress by knowing what you’re going to say. Also, breathe and calm down before you knock—use whatever ritual you need to steady your nerves. 2. Take a friend or shadow someone with experience. If you’ve never done this before, tag along with someone who has and see what they do and how they do it. Don’t be intimidated though if they seem better than you. You don’t have to do it their way; find your own style that works for you. 3. Make the person who answered the door feel at ease. a) Stand a decent distance away from the door and hold up identifying information. Nobody likes opening the door to someone they don’t know, so do your best to at least let them know what organization you’re with. By standing back a bit, people can see you and any campaign literature you’re holding up, either through their peephole or window. b) When they open their door, introduce yourself (first and last name) and why you’re there. Usually, when canvassing, you’ll know the names of the people registered to vote at the homes you’re visiting. Don’t ask for those people before you’ve identified yourself. People are often taken aback when you know their name before they know yours. Giving them your name right away puts the person at the door on a more level playing field, which they will appreciate. c) Give the other party a chance to speak. We’re not car salesman or telemarketers trying to cram in as much information as possible to prevent people from interrupting you. If the people at the door don’t want to talk, you’ll be able to tell pretty quickly. But if they want to engage in a conversation or ask questions, let them! When people have sincere concerns about government, sometimes they just want people to listen, and us introverts are known to be pretty good at that! In fact, the energy you project as an introvert may make you less threatening than highly extroverted canvassers. 4. For people who aren’t home, leave a note. Most of the time, people won’t be home or won’t answer their door. If you have time, leave a sincere note saying you’re sorry you missed them and you hope we can count on their support. 5. For people who are rude, respond back with politeness. There’s no way around it. Some people will be upset that you knocked on their door, and they’ll let you know it. Just remember, no matter how people react, you don’t need to take it personally. Some people just don’t like being bothered, no matter how considerate you are. Know that you tried your best, and you don’t deserve the verbal abuse that might come your way. Instead of responding with anger, I like to respond as politely as possible. Hopefully, the rude individuals will later realize they shouldn’t have been so hard on you, or even better, they might take a second look at your candidate once they’ve calmed down. I hope you find those tips useful, whether you’re already canvassing or are thinking about it. If you know an introvert who would find the information above useful, please share this with them. Volunteering on a campaign is a great way to meet other people who share your interests and ideals. For introverts, it’s so much better than making small talk at a bar or other networking events. If you want to start off slowly, just show up at a campaign office and ask for some work to do. Whether you choose to canvass or not is completely up to you, but you should seriously consider it. Introverts have their own unique strengths and talents to offer any campaign.